The conference is a joint event bringing together two recent academic initiatives focusing on the research on the history of the Roma and supporting new approaches in the field: the Prague Forum for Romani Histories and the Research network on ‘Legacies of the Roma Genocide in Europe since 1945’, which is funded by the Arts & Humanities Research Council (AHRC, United Kingdom). Both initiatives aim at fostering a debate on the history of Roma as part of European history and contemporary European society. The AHRC-funded Research network on ‘Legacies of the Roma Genocide in Europe since 1945’ is an international group of historians, social scientists, and scholars of language and culture, working with representatives of Romani communities to explore how the genocidal policies pursued in Europe between the mid-1930s and 1945 have shaped the social, political, and cultural history of Roma since 1945. It is led by Celia Donert and Eve Rosenhaft at the University of Liverpool in partnership with the MigRom project at the University of Manchester and the Romani Studies Seminar, Charles University, Prague. The conference is closely linked to its other activities planned for 2017 (workshops for researchers on conceptual approaches and state practices, as well as other events for the general public). The Prague Forum for Romani Histories is an international academic initiative to promote interdisciplinary, intersectional, and transnational scholarship and dialogue on the study of the Roma as an integral part of European societies and an integral component of the historic research in and of Europe. Supporting methodological approaches that concentrate on processes of social differentiation and acknowledging the problematic role of disciplinary knowledge in reifying unequal power relations, the Forum seeks to contribute to decentring hegemonic national and identity-based narratives in European history. By doing so it seeks to promote reflexive, self-critical work which foregrounds Roma as historical co-actors, without downplaying discrimination and persecution histories. The Forum is institutionally based at the Institute of Contemporary History of the Czech Academy of Sciences, Prague. The partners in establishing the Forum are CEFRES, Prague, and the Romani Studies Seminar at Charles University, Prague. The planned conference is the inaugural event of the Forum. The conference will be complemented by a workshop for Ph.D./MA students whose final theses are based on a historically informed approach to the study of the Roma. The workshop will be organized by the Prague Forum for Romani Histories in cooperation with the NAIRS (Network of Academic Institutions on Romani Studies) Summer School and announced in a separate call. 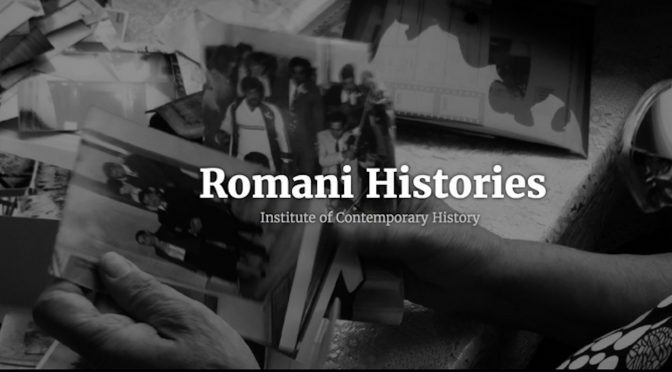 For further information, please visit the website of the Prague Forum for Romani Histories and/or NAIRS. Understanding the genocide of the Roma during World War II seems crucial for understanding the post-war history of Romani families and communities across Europe. At least 130,000 Roma were killed as a direct result of racial policies pursued by the German state, its allies, and other European states between 1933 and 1945. Some activists and scholars claim that as many as half a million Roma were killed. Yet although the mechanisms and scope of the Roma Holocaust are now partly understood, the legacies of mass killing, ghettoization, sterilization, and slave labour for first-, second- and third-generation survivors are still unknown. It appears likely, however, that understanding the trauma of the mid-twentieth-century genocide, as well as its contested recognition by majority societies, is of paramount importance for understanding the persistent discrimination against European Roma today. The purpose of the conference is accordingly to map current research and guide a developing research agenda, investigating the ways in which past experiences and memories of persecution and violence have influenced family histories, political and social identities, and state-society relations amongst the Roma in different parts of Europe since 1945. Such investigations necessarily have a broad geographical focus, going beyond the more familiar sites of memory like the Auschwitz Gypsy camp to consider topics such as the legacies of the wartime deportation of Romanian Roma to Transnistria. We also welcome critical longer-term approaches to periodization, which might shed light on the specificity (or otherwise) of the events that took place between the mid-1930s and 1945. Our hope is thus to promote much-needed comparative and transnational perspectives on the history of Roma in post-war Europe, and also to connect scholarship in the field of Romani Studies to broader debates about the legacies of genocide in contemporary European history. We invite papers from scholars in all disciplines, including historians, ethnographers, and cultural studies scholars, and particularly welcome cross-disciplinary, comparative, and transnational approaches. Our aim is not to reify an image of the Roma as homogeneous victims of genocide. Rather, we invite contributions that explore and contest narratives of victimhood, for example, by investigating the various ways in which individuals and families have responded to the experience of discrimination in everyday life, interactions with public authorities, politics, economic activities, or activism. How might we search for the traces of genocide in the subjective and material experiences of Romani families since the end of the Second World War? How can scholars trace and narrate the legacies of the Roma genocide within families of first-, second- and third-generation survivors? To what extent can we compare the memories of persecution amongst Roma in different places, and in different migration contexts and with other population groups? To what extent have continuities in discriminatory practices within local and national welfare agencies, police, health and education authorities in post-1945 Europe influenced experiences and memories of persecution among Roma communities and families? In the light of an emerging agenda of memorialization among Roma advocacy groups, how can we contribute to contextualizing policies and practices of commemoration and memorialization in different local, national, and transnational sites since 1945? How has the legacy of genocide shaped the political construction of Romani identities, for example, through social activism or political movements? What are the ethical and political dilemmas for historians who seek to explore these histories of trauma and violence? We expect to be able to pay full travel and accommodation costs. Abstracts of up to 500 words and a short biography should be emailed to legacies2017@gmail.com by 31 March 2017.